And it has Muppets. That pretty much seals the deal. I don’t think I can properly explain how much I love the Muppets. My wildly jubilant review of the latest film probably gives you a clue, but they are the kind of characters that simply mean something to those who love them, transcending the screen to create an intangible but very real sense of warmth in the viewer. I don’t think it’s a stretch to call the Muppets the greatest comic troupe in the world, but they are so much more than that. “The Muppet Christmas Carol” is proof: no one celebrates and extols the virtues of Christmas quite like the Muppets. At the time the film came out, however, the Muppets were at a bit of a crossroads. It was the first production made after the sudden death of creator Jim Henson, and one has to imagine that continuing past that point had to be difficult for the entire Muppet crew. In that regard, the brilliance of “Carol” is that the team decided to go in a new direction, to use these characters in ways Jim Henson never had. The first three Muppet films are all very different from one another, but they are also all of a piece, original stories set in a canon where the Muppets are ‘real;’ “The Muppet Movie” and “The Great Muppet Caper” were both fictional films the ‘real’ Muppets had created (hence the meta-narrative of the characters gathering to watch the premiere of the first movie), while “The Muppets Take Manhattan” followed the characters in their real lives struggling to put on another show. The precedent for this continuity was established in “The Muppet Show,” and it’s what Jason Segel and company returned to for the most recent Muppet movie. But “The Muppet Christmas Carol” (and its successor, “Muppet Treasure Island”) tries something different, using the Muppets to re-tell a classic story in no particular continuity and, for the first time ever, casting a human in the leading role. 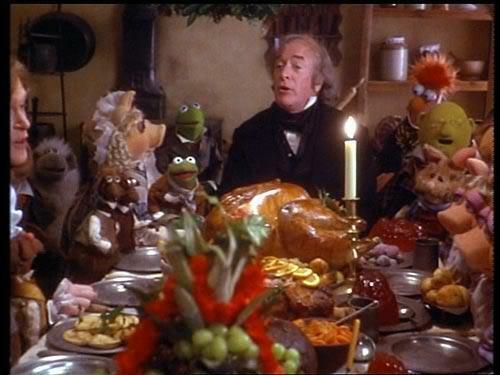 The move has always proved controversial among Muppet fans, and while I’m glad the Muppets weren’t stuck reciting literary classics forever, I believe it’s an experiment that paid off in spades, especially in “Christmas Carol.” The film proved that the Muppets could branch out in bold new directions while still retaining the qualities that make them so universally endearing. Watching “Carol,” one can easily imagine Jim Henson looking down from heaven and smiling at what his friends accomplished without him, even if it was different than what he had done in life. In fact, the film’s mastery of the Muppet characters is what makes this “Carol” stand out from the pack. Kermit (the wonderful Steve Whitmire gracefully taking over from Henson) as Bob Cratchit? Well of course! Who else could play that part? That means we get the irresistibly adorable Robin the Frog as Tiny Tim, and a well-cast Miss Piggy as Mrs. Cratchit! Who can forgetting watching Fozzie Bear play “Fozzi”wigg, Dr. Benson Honeydew and Beaker as the collectors for the poor, Sam the Eagle as the Schoolmaster, and in the film’s most inspired casting move, Statler and Waldorf as the Brothers Marley? 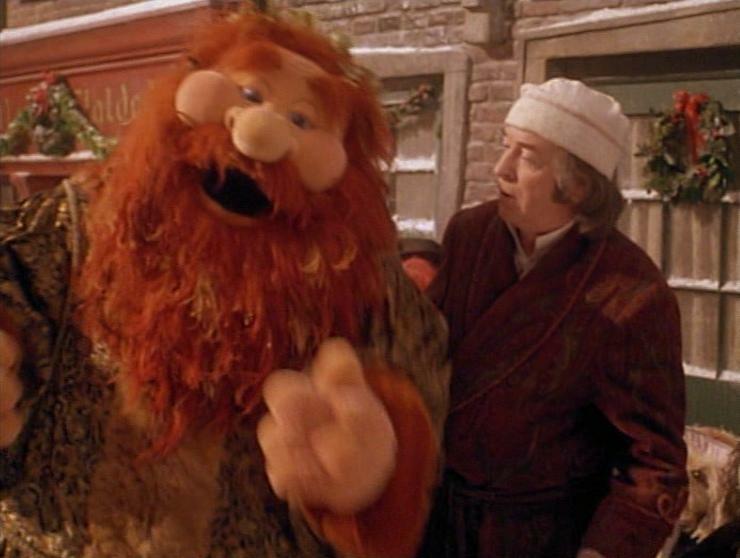 Seeing these characters in these parts isn’t just a novelty; the film is a legitimate, heartfelt production of a Christmas Carol, but cast from a pool of Muppets rather than humans. The Muppets have always been ‘performers’ eager to put on a show, so why not let them do a bit of British drama? They’re awfully good at it, and they’ve all been exceptionally well cast. 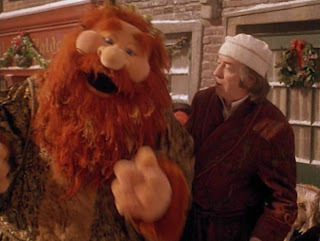 There’s one major role that simply couldn’t go to a Muppet, however, and that’s Ebenezer Scrooge. What Muppet could play him? We are naturally inclined to like the Muppets, even the misanthropic ones, and all good Christmas Carols require us to hate Scrooge at the outset. Casting a human was only natural, and Michael Caine is simply brilliant in the role. 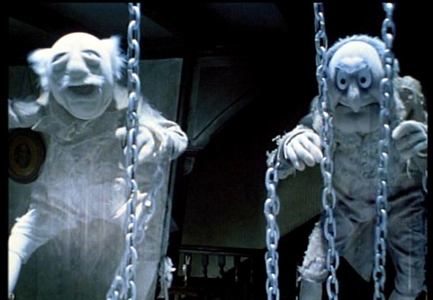 One of the great things about “The Muppet Christmas Carol” is that it’s never afraid to go dark, so Caine gets to play one of the angrier and more violent Scrooge’s in the “Carol” cannon; in an early scene, for instance, he does more than simply tell carolers to go away – he actually kicks the poor Muppet out into the snow! Caine really sells it, and while his Scrooge is dark early on, he also immediately finds the humanity in the character, something essential for any “Carol” adaptation. More importantly, he illustrates Scrooge’s transformation spectacularly; so many Scrooge portrayals are rigid, mean and disdainful until the very end, but Caine changes Scrooge gradually. There’s a wonderful moment, when Scrooge watches the Ghost of Christmas Present execute a musical number, where his scowl slowly melts and turns to glee. Caine is also terrific at acting alongside Muppets, something not all actors are capable of, making the viewer forget that he’s the lone human among these lovable felt creations. The first number, Scrooge, is a dark, creative, and undeniably catchy introduction to the character. One More Sleep ‘Til Christmas, sung by Kermit on his way home from the office, perfectly represents the excitement and joy of Christmas Eve, and quickly establishes that Whitmire is every bit Henson’s equal as Kermit. Marley and Marley is, I believe, the only song Statler and Waldorf have ever performed, and it’s marvelous for how it stays true to the characters while presenting a large chunk of exposition from the book. In the middle of the film comes When Love is Gone, possibly the saddest, most heartbreaking moment in a Muppet movie, and also one of the bravest. It is sung during the Christmas Past sequence by Scrooge’s fiancé, Belle, as she breaks up with Scrooge. 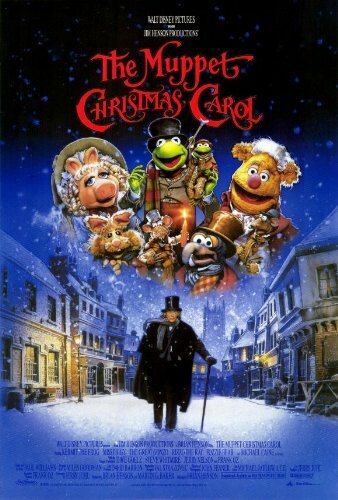 The song is beautiful, haunting, and presents Scrooge with a powerful emotional turning point present in no other version of “Carol.” As fate would have it, the song was cut in theaters because executives found it too “sad.” No widescreen version of the film with the scene reinserted is available on DVD – it can be viewed only during the cropped, full-screen presentation – which is a terrible shame. The widescreen version exists – it was released on LaserDisc – and I sincerely hope that if Disney gets around to putting the film out on Blu-Ray in the future, they do the right thing and present the uncut version of the movie. Anyway, the next song isn’t just the best in the movie, it’s actually my favorite Christmas song of all time: It Feels Like Christmas is delivered by the Ghost of Christmas Present as he takes Scrooge to the center of London and tells him, in musical form, what Christmas really means. I can’t quite put my finger on what it is that makes me love this piece so much: the tune is festive and inspiring, Jerry Nelson’s singing is infectiously joyous, and I absolutely love the lyrics, but the whole is so much greater than the sum of its parts. Bless us All is a very nice song sung by Tiny Tim and his family, one that quietly captures the essence of a Christmas dinner with family. 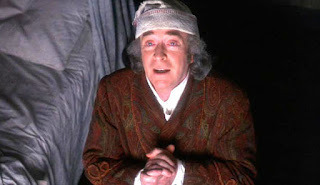 Michael Caine sings the last song, Thankful Heart, as Scrooge travels through London making amends. Again, the music gives us a different take on the material, but one that is all the more powerful for the added expression music allows. In fact, that’s the great strength of the music; over and over again, the film uses these songs to express more than dialogue ever has in other versions of “Carol.” The music doesn’t just add a festive, jubilant tone to the film, but gives Scrooge organic opportunities to learn and be humbled; the effect on the audience is just as strong. For me, the music is what puts “The Muppet Christmas Carol” a step above all other “Carol” adaptations; it adds an emotional, touching element that I find simply irresistible. In fact, touching is the best word I’d use to describe the whole movie. It’s not just the music – Caine’s performance, the brilliant use of the Muppet characters, the unique, quirky humor, etc. “The Muppet Christmas Carol” just hits me in a way no other Christmas film does, no matter how many times I watch it. This was the first Muppet film released in my lifetime, only two months after I was born, and I honestly can’t remember a time when I wasn’t in love with the film. It’s only gotten better with time. A very Merry Christmas to all of you; I hope you enjoyed this 25-day yuletide journey as much as I did! Things won’t be slowing down on the site now, however – tomorrow begins Top Ten List Week here on “Jonathan Lack at the Movies.” There will be two lists tomorrow – Worst of the Year and Best TV Shows, and on Tuesday, December 27th, look for my Top Ten Films of 2011 in both written and, for the first time, VIDEO form!